1. PHINEAS6 MOORE (THADDEUS5, ASA4, JAMES3, JACOB2, JOHN1) was born 26 Oct 1788 in Worcester MA, and died 28 Dec 1874 in Clinton MA. 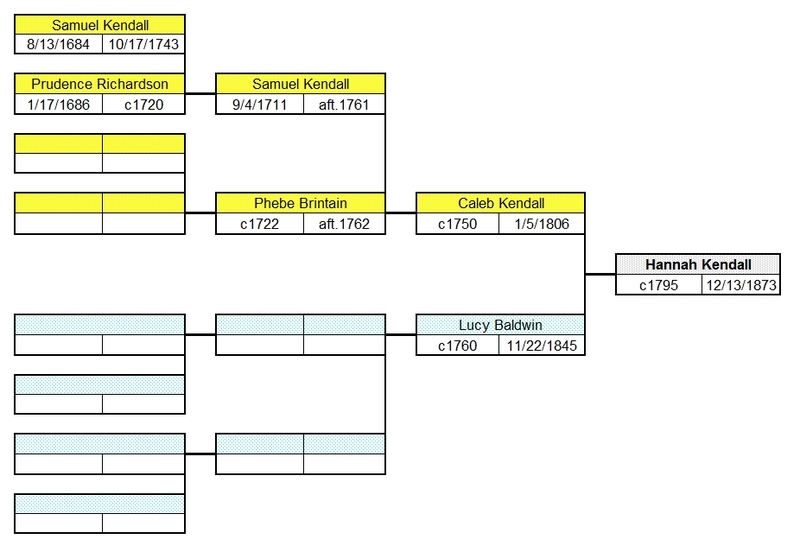 He married HANNAH KENDALL 04 Aug 1811 in Boylston MA, daughter of CALEB KENDALL and LUCY BALDWIN. She was born Abt. 1795 in Boylston MA, and died 13 Dec 1873 in Clinton MA. 2. i. THADDEUS7 MOORE, b. 25 Jul 1812, Gardner MA; d. 24 Aug 1895, Sudbury MA. 3. ii. EZRA SAWYER MOORE, b. 29 Nov 1814, Gardner MA; d. 24 Feb 1895, Somerville MA. iii. LUCY KENDALL MOORE, b. 01 Sep 1816, Gilsum NH. iv. ALMIRA W MOORE, b. 03 Nov 1819, Boylston/Holden MA; d. 07 Jul 1873, Holden MA; m. ? ROGERS. v. ABBIE MOORE, b. Abt. 1824, Boylston MA; d. 26 Jul 1911, Worcester MA; m. JOHN GROVER. vi. HANNAH T MOORE, b. Abt. 1830, Boylston MA; d. 04 Jun 1900, Worcester MA; m. JONATHAN LOVELL WHITNEY, 06 Jan 1848, Berlin MA. vii. AARON B MOORE, b. Abt. 1833, Boylston MA; d. 14 Jun 1907, Fitchburg MA; m. MARTHA MCTARGETT, 25 Feb 1867, Springfield MA. viii. SUSAN K MOORE, b. Abt. 1835; d. Aft. 1854; m. DANIEL P HARTWELL, 01 Nov 1854, Berlin MA. 4. ix. JOSIAH MOORE, b. Abt. 1827, Boylston MA; d. 10 Jun 1891, Berlin MA. 2. 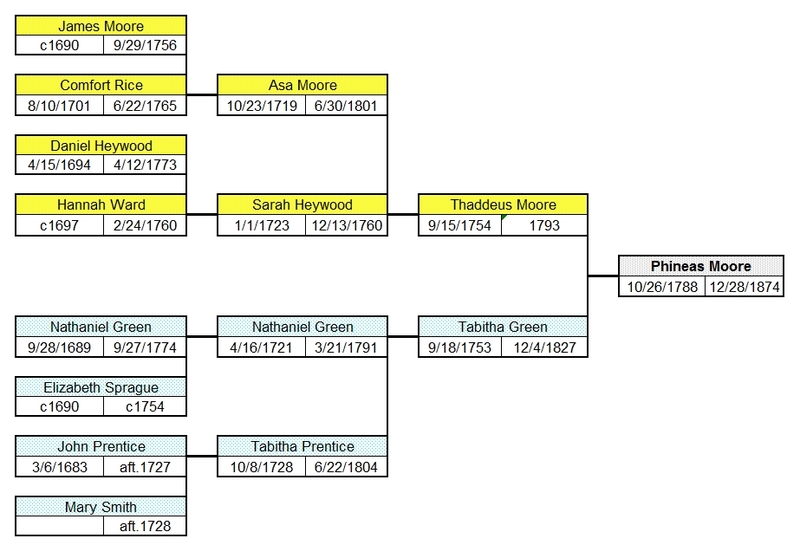 THADDEUS7 MOORE (PHINEAS6, THADDEUS5, ASA4, JAMES3, JACOB2, JOHN1) was born 25 Jul 1812 in Gardner MA, and died 24 Aug 1895 in Sudbury MA. He married ELIZABETH ANN WHITNEY 17 Dec 1846 in Watertown MA. She was born Abt. 1821 in MA, and died Bet. 1865 - 1870.
i. FRANCES F8 MOORE, b. Abt. 1842, MA - mother? ; d. Aft. 1865.
ii. ELMIRA E MOORE, b. Abt. 1849, Worcester MA; d. 13 Aug 1849, Worcester MA. iii. MARY JANE FORRESTER MOORE, b. 25 Jul 1850, Worcester MA; d. 07 Mar 1869, Sudbury MA. iv. IRA THADDEUS LYNES MOORE, b. 07 Aug 1854, Sudbury MA; d. Aft. 1920; m. LYDIA A BELCHER, 25 Apr 1883, Framingham MA; b. MA; d. Aft. 1900.
v. GEORGE W G MOORE, b. Abt. 1858, Sudbury MA; d. 19 Nov 1866, Sudbury MA. 3. EZRA SAWYER7 MOORE (PHINEAS6, THADDEUS5, ASA4, JAMES3, JACOB2, JOHN1) was born 29 Nov 1814 in Gardner MA, and died 24 Feb 1895 in Somerville MA. He married LUCY CARTER 20 Apr 1843 in Bolton MA [4/1/1843 Berlin MA]. She was born Abt. 1826 in MA, and died Aft. 1880.
i. EUGENE E8 MOORE, b. 28 May 1850, Berlin MA; d. 02 Jun 1850, MA. ii. LELIA HANNAH MOORE, b. 06 Jun 1852, Berlin MA; d. Aft. 1920; m. (1) JEROME B NELSON, 22 Oct 1879, Hudson MA [10/2/1879 Berlin MA] - later divorced; b. 25 Sep 1854, Somerville ME; d. 02 Oct 1909, China ME; m. (2) JOSEPH COFRAN HOUGHTON, 01 Nov 1888, Berlin MA; b. 03 Jan 1852, Berlin MA; d. 07 Dec 1908, Hudson MA. iii. ARTHUR MARSHALL MOORE, b. 23 Jul 1856, Berlin MA; d. Bet. 1910 - 1930; m. (1) JENNIE A HOWE, 23 Jun 1876, Hudson MA; m. (2) AMELIA MILLER, 17 Nov 1883, Greenfield/Boston MA; b. 09 Jun 1859, MA; d. 09 Mar 1945, Los Angeles CA. iv. LUCY GRACE MOORE, b. 24 Dec 1863, Bolton MA; d. Aft. 1930. 4. JOSIAH7 MOORE (PHINEAS6, THADDEUS5, ASA4, JAMES3, JACOB2, JOHN1) was born Abt. 1827 in Boylston MA, and died 10 Jun 1891 in Berlin MA. He married (1) ELLEN L KEYES 27 Dec 1847 in Lancaster MA, daughter of ROSWELL KEYES and LOIS HOWE. She was born Abt. 1831 in Carrington VT, and died 02 Jun 1856 in Barre MA. He married (2) FIDELIA A SMITH 24 May 1857 in Farmington ME [5/4/1857 Berlin MA], daughter of SAMUEL SMITH and MARY SPRAGUE. She was born Abt. 1833 in ME, and died 04 Jun 1897 in Berlin MA. i. JENNIE F8 MOORE, b. Abt. 1860, MA; d. Aft. 1870. 5. ii. NETTIE A MOORE, b. Mar 1862, MA; d. Aft. 1930. 5. NETTIE A8 MOORE (JOSIAH7, PHINEAS6, THADDEUS5, ASA4, JAMES3, JACOB2, JOHN1) was born Mar 1862 in MA, and died Aft. 1930. She married JAMES TUSEL LEARNED 03 Dec 1885 in Berlin MA, son of WILLIAM LEARNED and MARIETTA WHITNEY. He was born 11 Mar 1860 in Gardner MA, and died Aft. 1930.
i. KENNETH M9 LEARNED, b. Mar 1887, MA; d. Aft. 1910.